Karnataka was influenced by Jainism since around BC 3 and was at the peak till Hoysala Dynasty. Till the “King Vishnuverdhan” of Hoysala Dynasty, most of their kings were Jains. In these times, Kings, Generals, and other rich people had built many Basadi, Temples and monuments in different places of Karnataka. Bhatkal was Vijayanagar Empire’s important port. Merchants came around the world to sell their goods especially Horse for the Vijayanagar Kings and in return they took Sugar and fine white rice was exported. Many of old Temples and Basdi were built in the coast during this time. Some of them are in Bhatkal, Upponi, Nagara Basadi Katte, Kembal, Valagalli, Kumta etc. Most of these in the ruins and in very few they worship now. We are trying to show some of these places in our itinerary so that if anyone interested in reviving, it will help. Day 1: Pick up from Mangalore Airport. Proceed to Moodabidri. Check in to The Hotel. Evening Visit to Soans Farms a world of agricultural and botanical diversity. Shop for spices and fruits. Halt. Day 2: Visit Thousand Pillar Temple and other places connected with Jain Importance. Halt. Day 3: Visit to Varanga Jain Temple and Jain monuments around Karkala. Day 4: Visit to Dharmasthala, Venur Jain Monuments. Day 5: Visit to Chandranath temple, Parsvanatha Swami temple, Jawalamalaini Temple in NR Pura and Kundadri Hills. Day 6: Visit to “HOMBUJA” Padmavathi Devi Jain Temple. Day 7: Visit to Shravanabelagola, Kambadahalli. Halt. Day 9: Day Free in the Coffee Estate. Day 10: Visit to.Kanakagiri Jain Temples. Day 11: Proceed to Kundapur. Halt. Day 13: Visit Bolamballi Padmavathi Devi Temple & Jain Temple in Bhatkal. 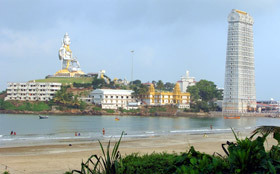 Day 14: Visit Beach Temple at Murudeshwar. Day 15: Tour ends. Transfer to the Mangalore Airport. ++ Visit to Basadi, the Pepper Queens Island. Please be aware that you might have to walk around a kilometre to reach this destination. ++ Visit to Nallor Digambara Parshwanath Swami Basadi. +Tour includes accommodation on twin sharing basis. If anybody wants single room, the supplement charge will be extra. +Transportation to different destinations by A.C Bus OR A.C Tempo Traveller OR A.C Car depending on the size of the group. Toll, Parking fees, Drivers Bata. The entry fees (Also cameras and video charges if any will have to be borne by the traveller) Expenses of Personal Nature, Other than all that is mentioned in "Tour Includes" All packages starts from and ends at Mangalore Airport. All disputes subject to Kundapur Jurisdiction. The little known Jain temple of Varanga is just an hour’s drive from Kundapur. There are 3 main temples. Chandranath Temple: is dedicated to Mulnayak Bhagwan Chandrapath & the idol is made of Chandrashila and one could see the light across the idol. Neminath Basadi: This temple is 1000 years old. The bronze idols of 24 Tirthankaras in Kayotsarga posture in the hall. 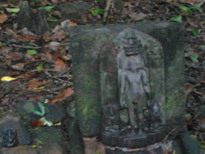 The idol of Mulnayak Bhagwan Neminath [5 feet tall] is in the Garbhagriha. 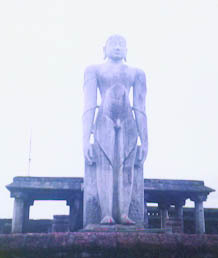 This 52 ft. high Bahubali statue is on the Gommata Betta. He is called Gommateswara- great Gigantic and majestic Ishwara, turning his mind away from worldly affairs. It was built in 1432 by Pandya Raja. Yearly celebrations are in February and once in 12 years "Mahamastakabhisheka" is celebrated.The next Mahamastakabhisheka will be held in the year 2027 . Be here to see how wonderful it will be to see the bathing ceremony of Gomateshwara. seat of Bhattaraka Shri Laxmisen. Samanthabadhra Acharya occupies a unique name in the lineage of Jaina Acharyas. He is said to belong to around 3rd or 4th century A.D. and his origin is traced to a region around the river Cauvery. After him we can find a series of around 5 Samanthabadhra Acharya’s in the Jain tradition. Of these the third Samanthabadhra belonging to Gerusoppa is said to be associated with Simhanagadde. The story goes as below. One day the Goddess Jwalamalini came in his dream and told him, “I do not want to stay here and I want to go somewhere else. So put me in the bullock cart and take me. You will see a place where Lions and Cows are not enemies and play together without enmity. You should establish my temple when you find this place”. As per the Goddess wish, he put the idol in a Bullock Cart. As he reached the present N.R Pur, a feeling of Peace and Tranquility came over him. He felt this was the place. When he walked a bit further, he came to a field where he saw a herd of Cows. He saw a Lion playing with the calves in the middle of the herd. Hence the name Simhanagadde (Lion-Field). A copper plate inscription at Simhanagadde mentions that he belonged to 15-16th century. This is the most important of all the Jain temples at Simhanagadde. 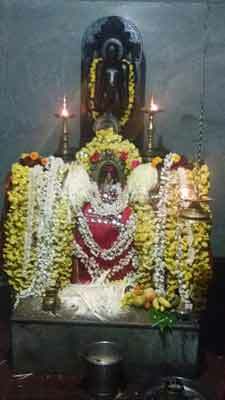 It has an attractive black colored idol of Goddess Jwalamalini as the main deity. The history of this idol dates back to the period around 15th & 16th century mentioned earlier in this article. It has a huge followership from across India and abroad. The temple has a very spacious hall and a sanctum sanctorum. There is a belief that when you are not sure of something that you want to do, if you come here and pray, the Goddess will give Yes or No answer. The Goddess is decorated with flowers and the priest will perform the pooja. The petitioner stands in front of the Goddess and prays in his mind. If the answer is Positive, it is indicated by the flower falling from the decorated Goddess. People of different religion come here for answers. Jala Mandir: This is a replica of the Jala Mandir at Pavapuri. temple is found an ancient memorial stone embedded on to the wall. This temple was reconstructed in 1988.
wide hall and a Garbhagriha. It has a 3 feet high marble idol of Lord Chandranatha in Padmasana seated on a lotus flower as the main deity. It has a gandhakuti and flanked by the idols of Goddess Padmavathi and Goddess Jwalamalini in the hall around the entrance leading to the Garbhagriha. 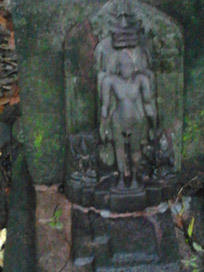 high black colored idol of Lord Parshwanatha in Kayotsarga as the main deity. A view of the Parshwanatha temple located at the top of Kundadri hillock. 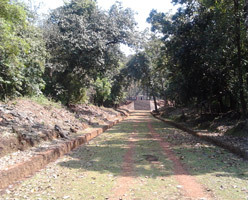 There is RuinedKundadri Kshetra is a small village in Theerthahalli Taluk, Shimoga District. and is blessed by Devendra Kirthi Battaraka. Around 3000 years ago this region was ruled by Thaila Arasa King and Bairavendra Arasu and was called Thaila Pura. 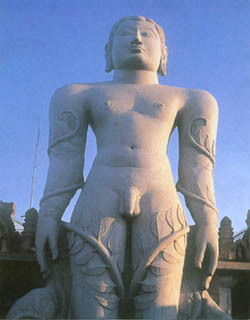 The ruling Jain Kings were very religious. In those days the 23rd Theerthankara Parshwanatha Swami and Maha Mathe Daravendra, built a basadi for Padmavathi Amma and worshipped her daily. They built a big pond and two small ponds next to the Basadi all carved out of rock. 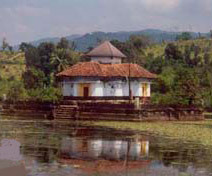 It is believed that the big pond is over 100 feet deep and its water is used for worshipping. This pond has never dried up so far. This pond is called Paapa Vemochana Pond meaning “Absolution”. The other ponds are called Naga Kanye Pond and Thavare Kola (Lotus Pond). Legend has it that if you pray to God asking him to forgive your sins and drop a lime in Paapa Vemochana Kola, it will appear in Humcha’s Muthina Kola. There is another basadi called “Hirre” Basadi at the foot of the hills in the forest that has not been maintained well and is in ruins. Around 2,400 years back an 8 year old boy from Kundakona Village started preaching Jainism and travelled around the country. When he reached this hill (the present Kundadri Hills) he was at peace and decided to meditate here. Sitting in Kamalasana pose, he meditated, floating 3 feet above the ground. He wrote around 68 Granthas on Jainism. At the age of 8 he started preaching Jainism, at 11 he took deeksha as Bala Brahmachari, at 17 he became Nirvana Muni. At the age of 98, he did Sallekhana Vratha and attained Moksha. Since then this region has been called Kunda Pushpa meaning Dundu Mallige flower. He was known as Kundacharya Muni. Out of 68 Granths, 5 are in circulation and are called Pancha Sara Nama. These have been translated into Kannada, Hindi amd Marathi. Out of these 5, the first one is called Samaya Sara, second Asta Pavada, 3rd Pravachana Sara, 4th Niyama Sara and 5th Panchasthi Kaya. When Kundachari was in Tiruvalli, he wrote a holi book called “THIRULORALL”. By writing this book, he was known as Kalikala Sarvajna. 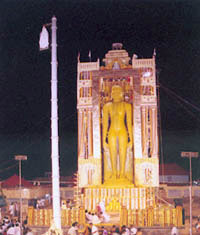 It is said, there is an idol of his in Chennai. 1008th Parshwanath Swami and Padmavathi Amma’s yearly festival takes place on 14th of January. Many people visit this place and walk up the hill. Now there is a road till the top. All the data was given by Mr. K V Shanthinatha Jain Priest, Kundadri Hills. Padmavathi, and Kama-Jinalaya where a Bahubali image of CE 898 (as per the history) exists even today. MYTHOLOGY: (Materials collected from the literatures from Humbuja): The arrival of Jinadattaraya founding a new dynasty, Padmavathi Devi alias Nokkiyabbe and Muttinakere (Pearl Tank) these are shrouded in mystery. Local Legends have sustained to perpetuate. The devotees are familiar with danta Kathe which tells about the super natural power to protect good and devoted. King Sahakara was Mahamandaleshwar and Lord of Northern Mathura. 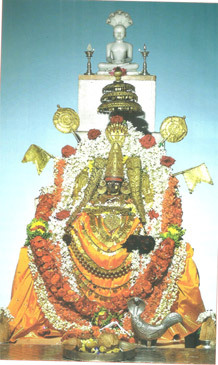 Padmavathi was the presiding deity of the place. Sriadevi was the crown queen and Jinadatta was his only son. Once Sahakara raja had gone for hunting where he fell in love with the beautiful huntress and return to the palace with her. She became his most beloved wife and with her he developed taste for eating flesh. In the mean time she gave birth to a son. She insisted that her son should succeed to the throne. Yielding to her pressure, Sahakara worked out a plan to kill Jinadatta. He kept two expert killers secretly in deity’s temple and instructed them kill the prince who enters with the Lemon in his hand. left palace on the horse to the temple. On the way his half brother met him and asked where is he going? When King Sahakara came to know the tragedy he was furious. He lost his senses and ordered the army to follow and kill Jinadatta. 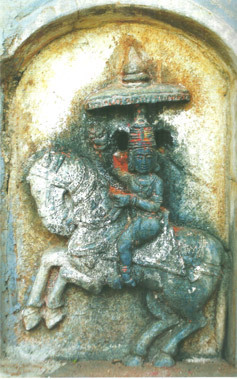 While Jinadatta was riding, he saw the army following him. When the army almost approached him, he lifted goddess Padmavathi picture towards the troop. Kings army lost its track and retreated. After a long travel he finally reached Pomburca Keshetra. Goddess Padmavathi in his dream and gave Cintamani or Sparshamani, the boon of divine touch wish fulfilling gem. She created Rasa_Bhavi, the well containing liquid that converts the base metal to Gold. He prospered, built the kingdom. To express his gratitude unbound, he built a huge temple and dedicated to Padmavathi. Parshwanatha Teerthankara Temple at Sringeri: It is believed that this Basadi was built around 1150 A.D. This Basadi is completely built with Granite Stone. In the Garbhagriha, there is one feet tall Parshwanatha Teerthankara idol. Main Deities - Stone idols of Bhagawan Adinatha, Shanthinatha, Chandranatha and Neminatha. History -, This place occupies a unique place in the list of Jain heritage centre in Karnataka. It was a chief Jaina centre during the Ganga and Hoysala period. 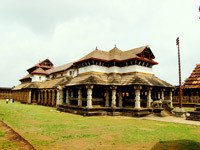 It is popular for the ancient Panchakoota Basadi, Shanthinatha Basadi and the Brahma Yaksha Manastambha. Both the Panchakoota Basadi and Shanthinatha Basadi resemble the Dravidian style of architecture. There is a legendary record mentioning that once there were more than 72 Jain temples at this place. All the Basadi at Kambadahalli have a heritage of more than 800 years. Jain Mutt at Kambadahalli - The Bhattaraka peeta that was redundant for more than 300 years was revived in 1998 by His Holiness Swasti Sri Charukeerthi Bhattaraka Swamiji of the Shravanabelagola Jain Mutt and Swasti Sri Bhanukeerthi Bhattaraka Swamiji was consecrated as the pontiff of the mutt. Since then Kambadahalli has undergone constant developments because of the continuous pursuance and personal interest taken by Bhanukeerthiji. 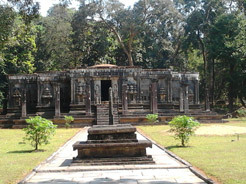 The temples at Kambadahalli were renovated recently by the Archeological Survey of India (ASI). Inscriptions at Kambadahalli indicate that more than 9 Bhattarakas of the Digambara ascetic order have adorned this peeta. This is not a Jain Temple. However it is one of the famous World Heritage Places to Visit. Belur: This quaint hamlet - 38 kms from Hassan is located on the banks of the river Yagachi. It was once the capital of the Hoysala Empire today made unforgettable for its exquisite temples. The Channakeshava Temple is one of the finest examples of Hoysala Architecture. It took 103 years to complete and the reason is evident. The facade of the temple is filled with intricate sculptures and friezes with no portion left blank. Elephants, episodes from the epics, sensuous dancers... they are all there - awe - inspiring in their intricate workmanship. Inside are hand - lathe - turned filigreed pillars. The Kappe Chennigaraya Temple and the smaller shrines are well worth a visit. same. This magnificent temple - guarded by a Nandi Bull - was never completed, despite 86 years of labor. discourse given by a Jain Tirthankara) is said to have been held here! Jainism flourished well in this place for centuries and a big temple belonging to Sri Adinatha is found as a testimony in the heart of Maleyuru Kanakagiri as a Siddakshetra - Kanakagiri is referred to as the only Jaina Siddakshetra (the place of salvation of the Jain ascetics) in south India. Antiquity of Kanakagiri - The inscriptions, engravings of footprints, Samadhi Mantapas and nishadi caves throw much light on the heritage of the place. These stand as an edifice to the antiquity of the place and also the gamut of Jaina saints who lived here. Furthermore these also reflect the extent and depth of religious importance in an impressive manner. Pujyapadacharya - Pujyapadacharya was a unique personality among the Jaina ascetics and whose achievements were unbounded. His name is personified with Kanakagiri. It was the abode of Acharya Pujyapada as already cited above and who had a celestial power of contemplating with Sri Srimandaraswamy of Videhakshetra. He inspired Nagarjuna to install the sacred footprints of twenty four prophets and finally attained nirvana. Pujyapada has written Sarvartha Siddhi, Dashabakthi, Samadhi Shataka, Ishtopadesha and Jainendra Vyakarana. He was a great exponent in Ayurvedic Medicine. 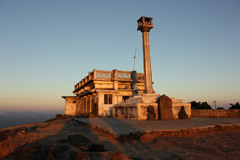 Ancient Jain Temple and the Royal Heritage - The main temple situated atop the hill belong to Bhagawan Sri Parshwanatha who constitutes the main deity of the temple in Kayotsarga. 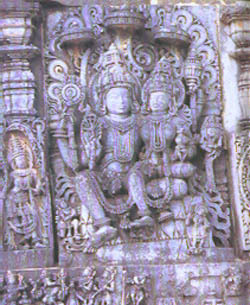 Lord Parshwanatha was worshiped by Hoysala kings. Goddess Sri Padmavathi Devi has blessed the place. The kings of the Ganga dynasty is said to have built this temple in the 5-6th century. The Hoysala Kings worshipped Bhagawan Parshwanatha before proceeding to war and is said to have been won these wars against all odds and thus described Sri Parshwanatha Swamy as Sri Vijaya Parshwanatha Swamy. Relief from Kalasarpa Dosha - Kanakagiri is the only place among the Jain centres providing relief to the ill effects of Rahu & Ketu as described in the Jaina heritage i.e. Kalasarpa Dosha. It is interesting to note that the idols of Sri Amra Kushmandini, Sri Nagadevate and Sri Padmavathi Goddesses are placed opposite to each These bring peace and tranquillity amongst the devotees. It is belived that this Basadi was built in 9th century by Keshavanna and Basavanna. Here you can see Parshwanath Swami in Kadgasana and in front Goddess Kooshmandini Devi in Koormasana. In 12th century Shree Charukirthi Bhattaraka of Moodabidri Jain Matt installed the idol of Devi to full fill people’s wishes.. The story goes as below. 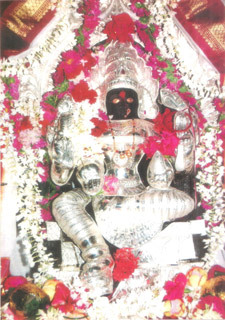 Mahamathe Kushmandini Devi is Shree Nemenatha’s Yakshi. She was in Shravanabelgola and was full filling all the devotees wishes.. Shree Charukirthi Swami was her priest and his dedications to the Goddess made him well know in the community. Hoysala King Veera Ballal was ruling that area and Halebeedu was his capital. There was Earth quake and Valcano in the Village Adguru near Halebeedu. The Lava was causing many casualities with people and animals and the King was worried. He remembered Shree Charukirthi Swami of Shravanabelgola and asked swami for the help. Swamiji agreed to help and took the idol of Goddess Kooshmandini. He went to the place where the Lava was oozzing out. He sat in the Chandana Peeta and Kept the Devi’s idol in the Koorma Peeta and prayed her for help. He put 108 Kooshmands to the place where the Lava was coming out to cool the earth. The openedd earth joined and the Lava stopped. King was happy and awarded him with the Title “Ballala Jeevarakshaka Shree Charu Kirthi Pandithacharya”. Shree Charukirthi Swami felt the Goddess wants to go to present undivied South Kanara and informed the King. King sent the Swamiji on the elephant with all the needy things. When Swamiji reached Nallur village of Karkala of the present Udupi district he rested. In the sleep he was inspaired by the goddess that she wants to stay there. Since then Goddess Shree Kushmandini Davi stays in the Village. It is belived that if you pray her with 108 names your wishes will be fulfilled. The last & the most famous Queen Channa Bhairavi Devi ruled the Salva Kingdom few centuries ago. Her Kingdom was known for forest produces and spices especially pepper, all over the trading world. So she was known as PEPPER QUEEN. The legend says there was Dravarasa well in which if you dip iron, it will turn into gold. Also the story says the focal point of the fish eye which is carved on the wall of Chaturmukha Basadi supposed to show the exact place where Dravarasa well is situated. D11: Proceed to Kundapur. Halt. D13: Visit Bolamballi Padmavathi Devi Temple & Jain Temple in Bhatkal. Bollamballi Padmavathi Devi : Long ago there was a partition in the Barkur Samstana in the time of last Mayura Verma King. “SHREEYALA DEVI” inherited the northern land beyond Gangolli River. This faction of Barkur Samstana came & settled in Bolamballi. The Padmavathi idol which was in the palace was brought here and “Prathishtapane” was done. You can also see PARISHANATH Theerthankara idol behind Padmavathi Devi idol. There is a belief that when you are not sure of something that you want to do, if you came here and pray the goddess will give yes or no answer. The Padmavathi Goddess is decorated with the flower & the priest will perform the pooja. The petitioner stands in front of the Goddess & prays. if the answer is positive, it is indicated by the flower falling from the decorated Goddess. D14: Visit Beach Temple at Murudeshwar. D15: Tour ends. Transfer to the Mangalore Airport. Soans Holidays (India) Pvt, Ltd,.